I am proud to present a guest post from Julie Broad. 8 years ago, Julie and her husband set out to free themselves from their J-O-B’s. Starting with just $16,000, they bought their first investment property. Today, they are real estate millionaires and Julie officially retired from work at age 31. They now own a small business around helping other people achieve their real estate investment goals. Editor’s Note: Julie’s story just goes to show that there are many different ways to make money and you just have to find the way that works for you. If you are interested in learning how to start your own business, click here to take my FREE 6 day mini course on ecommerce. Martin, our money man and main investing partner, emailed us last night and said simply “I’ve pretty much lost it all”. We’d been shopping for a commercial property to buy to diversify our investments. Martin has partnered with us on four different residential properties, and had agreed to once again partner with us on this commercial property. My answer is always a resounding “It depends” or “Diversification is best”… but if you change the question and ask me where my money is invested, 90% of my money and my net worth resides in real estate (even excluding my current home). You Can Kick It! Real estate is tangible. You can drive by a property and tell your friends or family that it is your property. You can also check up on how it’s doing. That is not as easy if you just own shares in a company. There’s nothing to show your friends and family, and most company’s won’t let you sit in on their meetings to see how they are doing! Leverage: If you have $16,000 to invest (which is what I started with 7 years ago), you can buy $16,000 worth of stocks and bonds. But, if you buy real estate, you can buy a property worth $160,000 (which is exactly what I did). While some stock investors are able to buy on margin (when you only put down a portion of what the stock is worth), this is a sophisticated and high risk move that only experienced stock investors typically make. If your stocks go up in value by 5%, you’ve made $800. But if your property goes up by 5% you’ve made $8,000! This is on the same $16,000 investment. This doesn’t even take into account the other ways you can make money from real estate….which leads me to my third reason I love real estate. There are three ways to make money from real estate: Appreciation, which we discussed above, rental income, and other people’s money (your renters) paying the mortgage down. Even if your property is decreasing in value, you are still getting paid rent and that rent is paying down the mortgage, and the surplus after expenses are paid is hitting your pocket! Control: As a shareholder of a company, you have no control over your investment. And, you never really know what’s happening behind closed doors. I don’t need to start naming the corporate disasters of the last decade like Nortel, Enron and WorldCom for you to really understand what I am saying! But with real estate you do have control! If electrical bills are too high you can change the light bulbs to more efficient ones, seal the windows, and take other measures to reduce the costs. If you are losing money, you will know it very quickly! And you will be able to take measures to improve this situation. With shares, what can you do if your shares in Nike drop 15%? You can sell more or you can buy more… that’s it. Creative ways to make money. A simple stock investor has two ways to make money from stocks… appreciation in their value and dividends. I owned stock with dividends once. The $30 cheque once per year was incredibly rewarding. Because you have control over your property, and there are three different ways to make money from the property, there are plenty of creative techniques to try to make more money from your asset. Some people rent out the garage separate from the house. In the right location, you could sell advertising space or just get price reductions on work done in exchange for some advertising (ever asked a painter what kind of discount you can get on their work if you put up one of their signs on your lawn?? ), you can add vending machines or laundry facilities, you can change the density of the property (add more units… more units means more rent), or you can change the usage of the property to sell it to someone who can make better use of it (if you are in a commercial area, an office developer might want to pay big bucks for a properly zoned property to develop on). 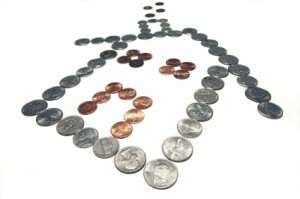 There are dozens of ways to turn a simple house into a money making machine with creativity. The same can’t be said for stocks. Access to the Equity without selling the asset. In the example of the $16,000 I used to buy my first investment property, I was holding most of that money in mutual funds and GIC’s. When I cashed out, I had to pay tax on the gains! So, while I actually had just under $20,000, after the government took their share, I only had $16,000. With real estate, when you need a chunk of cash, you can refinance a property or take out a secured line of credit against the equity you’ve built up in the property. This means that you get to continue making money from the rental income on that property AND someone else continues to pay down you mortgage AND if property values are appreciating, you will continue to have an appreciating asset AND you get the money you need – without taxes to pay too! And speaking of taxes… real estate has a lot of tax advantages. Taxes vary by province and state so I won’t get into all of the different advantages… but suffice to say that there are plenty of opportunities to write off expenses against your income, write off the interest on your mortgages, and reduce capital gains taxes. With so many reasons to love real estate, I haven’t been able to go back to the markets. It’s not to say you should do that too! It’s a personal choice, but I know Martin, our money man, is wishing he’d never put his money in the hands of his trusted stock broker. Even in our absolute worst real estate investment we broke even…and in less then 2 months he lost 40% of his money…and worse for him is he lost a significant portion of the down payment he was going to use to buy the commercial property. Maybe some of them will come back, but he’s afraid that a lot of his money is lost forever. Customer Service Skills: How Would You Handle These Awkward Situations? I have been reading Julie and Dave’s newsletters since they started … They have made a significant impact on how I personally perceive real estate and add ample knowledge which I am able to reference. A true success story – thanks again to Julie for sharing her invaluable experience and helping others make better decisions!!!! It’s true, she quit her job, but she remains focused growing our real estate portfolio and working on our real estate investing education series. Way to go Julie! As an ex stock and commodities broker my husband says the only sure way to double your money is fold it in half and put it back in your pocket. I totally agree that stocks and bonds are out of our control. Real Estate is the way to go. Thanks for another informative article Julie. I have read a number of Julie’s articles in the past and I have always appreciate the clarity with which Julie’s writes. This is another great article. I know very little about real estate, although it is a subject that intrigues me, so it is always a great comfort to come across practical articles that are written with novices like me in mind. I would love to read more about some of the tax advantages of real estate investments. The sixth point in the article – about having access to the equity without having to sell the asset is great food for thought. I appreciate having real life examples to highlight the points made in the article. This is what I have always wanted to invest in. Real Estate. Julie has done a great job. Now she’s retired and she can live life with financial freedom. Steve, I am very proud to have a place on your blog! Thanks for having me as a guest author on your site. And thank you to everyone that stopped in and left such kind comments. I really appreciate the support, and I am glad to hear that you found some food for thought in the article! Feel free to send me any specific questions if you have them. I am happy to help other people get started real estate investing! The self-study will more helpful. You can visit some of the local real estate company websites. Firstly, start with how they market a property via social medias, real estate portals, local publishing, etc. You must try to concentrate which kinds of properties you want to specialize. Eg: Residential, Commercial, High Rise Buildings, Lands, etc. This will helpful for you to place your foot on the first step of your real estate career. Generally, I’d agree that real estate is a good investment option to consider. However, it also depends on your entry point. I doubt I made much in the last investment property I had. Still, if the opportunity arises, I’d be wanting to look into real estate investments again. It was an absolute pleasure having you guest post on my blog. I do plan on investing in real estate sometime in the near future and I’ll definitely stop by your blog for some sound advice. I’ve thought about real estate, but I am not convinced that this is the time. On one hand this may be the perfect time. Since the economy is down, you can purchase quite a few foreclosures at unbelievable prices. On the other hand, there is a huge surplus of real estate right now. A high percentage of real estate in the last few years was purchased as an investment or vacation property. In other words, when they were purchased there was no particular person in mind that was going to use the property. So now, many locations are vacant, not in use, abandoned, needing renters or leasers etc. because there are not enough people to live or do business there. That is on top of the dwindling economy — or at least part of the problem. In my area, I am seeing more requests for occupancy than I have seen in all my years of being here. If there is no one to use the real estate you purchase, and the property value and economy are declining . . . is it still a great investment for those who just have a few thousand dollars to start with? I actually feel the same way. Currently the real estate values in the areas where renting is optimal continue to drop. There’s this one street that is lined with “For Sale” signs all the way down extending about 2 football fields on both sides of the street. I’m sure that timing is a crucial element of any real estate transaction. Julie, would you care to comment on when the time is right? I personally feel a bit uncorfortable when i see a number of properties marked for sale!!. Then i would say, ‘is it company shares or real estate”. Sorry for my slow reply. I’m actually working on an article today that discusses timing your real estate investments. It will be sent out to our newsletter list next Monday. But I will try to summarize. First of all, let me say that real estate is impacted by global events, but it’s still very local. All of the examples you gave Sarah would be red flags for me, and I wouldn’t invest in those areas. That doesn’t mean I wouldn’t invest in real estate. Not every City in the U.S. or in Canada is in ruins. There are still plenty of markets that have good fundamentals…and maybe their property values have gone down but the underlying economic factors for that area are still strong. Secondly, it’s important to remember that there are three ways to make money from real estate. Property values increasing is only one… and to me it’s icing on the cake, but not the cake! Buy in an area that has a good probability of seeing values increase, but focus on buying a good deal. A good deal to me is a property that is cashflow neutral or cashflow positive property located in an area with good fundamentals (essentially this is an area with population growth, good employment, a low vacancy rate on rentals and improving infrastructure). Let’s say you buy a property for $150,000 today. If you hold it for 25 years, put $200/month in your pocket after the expenses are paid and your tenant pays off your mortgage with their rental payments, in 25 years your property will be paid for. Even if that property is only worth $120,000 in 25 years, you’ve still made quite a bit of money from it (and if it’s in a good area, there’s a pretty good chance it will be worth double what you paid not less!). AND – current market conditions – with interest rates so low and property values declining (but rental demand increasing in many areas), the current market is really full of deals if you care to look. I could go on and on… but at least I hope this helps a bit. Well, good luck to you all but be warned the dollar will be devalued this year by at least 30%. There are a thousand reasons but the most obvious, even 2 years ago, an American debt 350% of GDP. Ponzi schemes rampant from Madoff to Icelands debt 10 times its GDP and more to be exposed. In fact the whole US economy is a giant Ponzi scheme. One of the main causes has been the inflated prices of real estate. Real estate is going to take a very long time to recover. However, people will now rent homes as most of Europe. So I guess the landlords could make a small killing but small it will be. Take good care my American friends. I feel the same way. Currently the real estate values in the boundrys where renting is optimal continue to slow. There’s this one area that is lined with “For Sale” signs all the way down extending about 2 football fields on both sides of the street. I’m sure that timing is a crucial element of any real estate transaction. Julie, would you care to comment on when the time is right? Personally as my per own experience investing in real estate is far more better and safe as compared to stock market. Stock Market has lots of ups&downs but it gives instant money or instant appreciation Its not bad to invest in stocks but to have a safe side and long term investment plan then it is better to go with buying a piece land or property. In short go with real estate investments. Amazing list of top real estate blogs and like a who’s who list of people to network with. Some new to me but many familiar faces, all seem to provide a ton of valuable content. I am very fortunate to be connected to so many of them. Thank you for the inclusion! You do a great job with your lists. FYI, I am starting a podcast very soon. I hope to interview many people on the list. Hit me up if anyone is interested. Thank you for inspiring me to invest for real estate property, I admit at first, investing in real estate is a waste of money but as time goes by, I learn to appreciate the good effects through reading articles. You made me realize that real estate is worth investing. Real estate is one of the safest way to invest your money which will return with hand full of benefits. Thank you for your article Julie. My husband and I have been investing in real estate for approximately 3yrs. In that time frame we have flipped 9 properties(avg 1house every 3mo from auction to closing). Our biggest challenge monthly is finding a resource that provides us with potential properties outside of court house steps auction sales. We’d like to buy 2 houses evert 3 months to grow our company. We have made profit on every house and haven’t had any losses. We just need to find a resource for our houses outside of online auctions (that we realize like to sell near market value), courthouse auctions (we’re in Atlanta, GA and major investment companies come monthly with millions to buy up all the properties), and REO. We’ve recently entertained dealing with wholesalers. We would like to diversify our investment portfolio..but we need a good resource of properties (outside of auction.com and hubzu). Any advice? Great article! I loved how you mentioned that real estate is tangible. That is my favorite part about real estate. When I was trying to decide what to study in school that was the tipping point of my decision. It was so much easier to wrap my head around the idea of real estate and its tangible assets rather than all of the intangible aspects of common finance. Thanks for sharing! I would say I am in a different category from most. I have all ready purchased one property and have access to many more. What I need help with is the funding of the materials as I have the labor covered as well. I’m figuring $40000 which when sold worth double the investors money at at pay out of $80000 when the property is sold. I’m figuring a 5 to 10 month turn around at the longest. Just got know who to find said investors or where to look. Any help would be greatful. My brother wants to invest early in his future and retire early. It was explained here that he can earn a lot through real estates. Furthermore, it’s recommended to talk to real estate experts when planning to buy a real estate property. I love reading your posts. Thank you for sharing all your knowledge and insights with us! I thank you for posting this article. You’ve shared a lot of information and it’s a good choice to invest in real estate. More Informative! Thanks for sharing this useful blog with us. It’s really interesting and I have been following your blog for a long time and I like the content that you have shared with your reader. We Also provide the same service. Real estate produces more millionaires than any other investment. Further of equities and businesses. I credit all to my success along with working hard and smart. This is the best opportunity for all real estate investor.